This year’s Veterans Day was special for the Great Plains Auto Body team. They handed the keys to a refurbished 2012 GMC Terrain to veteran Ivan Hansen. Everyone at Great Plains Auto Body was honored to thank a deserving veteran and his family. The Great Plains Auto Body team is thankful for many other things, too. They’ve had the pleasure to do what they love for more than 25 years – serve their Greater Omaha neighbors. They’re thankful to help people get their cars back on the road after collisions. Frankly, when business owners and their employees are thankful for what they have and what they do, it’s only natural to want to give back. Great Plains Auto Body expresses that gratitude with free child seat safety checks. They also sponsor good causes throughout Greater Omaha. These include the Blair YMCA , Little League Baseball and Big Brothers-Big Sisters of America. 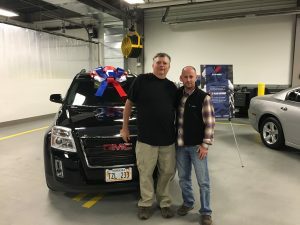 From their green practices to their community involvement, everything stems from the Great Plains Auto Body team’s appreciation of their community. Great Plains Auto Body is thankful for you. As we pause to celebrate Thanksgiving, everyone at Great Plains Auto Body hopes you can spend time with your loved ones and reflect on the things for which you’re grateful.